THIS COMPETITION IS NOW CLOSED. THE WINNER IS NICOLA TERRY, CONGRATULATIONS NICOLA, THE GOODWOOD REVIVAL WILL BE IN TOUCH WITH YOU TO ARRANGE YOUR TICKETS! This week’s competition is something I’m really excited about – a pair of tickets to the Goodwood Revival 2013! You probably remember the posts I did after visiting the Goodwood Revival last year, it was the most amazing vintage day out! For those of you who don’t already know about the Goodwood Revival, it’s a wonderful step back in time into the world of vintage cars and fashion at one of the world’s most beautiful and authentic racing circuits. The Revival is the world’s most popular historic motor race meeting and the only event of its kind to be staged entirely in the nostalgic time capsule of the 1940s, 50s and 60s. 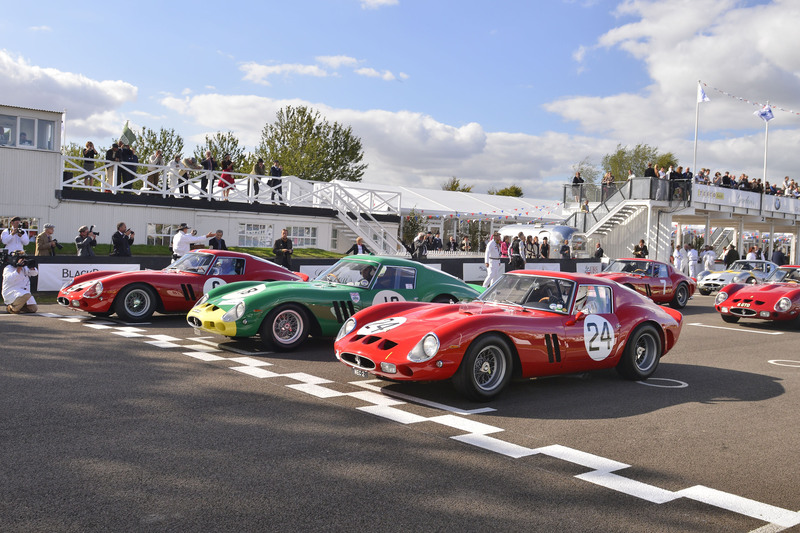 It is the biggest and best historic motor racing party of the year. The Revival offers visitors the opportunity to leave the ‘modern world’ behind and join motor sport luminaries including Sir Stirling Moss, Richard Attwood, John Surtees and Derek Bell in an unabashed celebration of flat-out, wheel-to-wheel racing around a classic racetrack, untouched by the modern world. You’re actively encouraged to dress in 40s, 50s or 60s clothing which, set to the soundtrack of live vintage music really adds to the atmosphere of the day! Two general admission tickets for Friday 13 September 2013. Take a look at the photos from last year’s revival on the Goodwood Revival’s Facebook page and post a comment below saying which photo you think captures the spirit of the weekend the best. It can be your favourite outfit, car or just something you think looks amazing! Don’t forget to follow the Goodwood Revival on Facebook and Twitter for more competitions, announcements and up to the minute action. Entries close at midnight on Thursday 16th May 2013. We will contact the winner shortly afterwards and pass their details onto The Goodwood Revival who will send out the tickets directly. There are no country restrictions, tickets are available to entrants worldwide but you will need to provide your own transportation to the venue. We Heart Vintage accept no responsibility for delivery of the prize, The Goodwood Revival will contact you and arrange delivery of your prize directly. Here are some more fabulous photos from last year’s Revival just to give you more of a flavour of the weekend. I can’t wait to go again this year! Fun for the kids too. https://www.facebook.com/photo.php?fbid=470341813017016&set=a.467171763334021.129612.116589758392225&type=3&theater Perfect styling for the occasion and a song to get lost in the moment! Ive been to Goodwood races but not the Rivival, love vintage styling so I would really enjoy this prize! The essence of vintage racing. Feels like this photo could have been taken in the 30s. This shot for me, perfectly captures the magic of The Revival on a sunny day: people dressed in period clothing, superb racing cars and a general passion for the era. Magic! An Event of Elegance, elegant Lady, a row of equally elegant Audi Silver Arrows. Perfect! Pictures of old cars driven by drivers in outfits from years gone by= classic Goodwood Revival! They are back. The Silberpfeile cross the time gateway into Goodwood as if they were coming out of an old sepia picture. The legend is alive. For me I think it’s this photo – there doesn’t seem to be an element in the photo that is out of place for the era and it looks like exactly the scene you’d have seen in the day; gentlemen racers and their cars & crew. It helps that the subject is a truly beautiful period car, of course.. The sun beams, people cheer, moving about frenetically and laughing with people they’ve never met. There’s no better place to take a picnic hamper, no better place to lindy hop, and certainly no better place to see the finest creations from the worlds of auto, moto and aviation. Up close, you can smell the rubber. And it’s not just like any kind of rubber, but the kind that transports you to a different time and place. cos its all about the racing and the speed. I love it!!! This picture doesn’t need explaination it just IS the Goodwood Revival at its best. In my opinion, a picture like this says everything about the spirit of the Goodwood Revival. These beautiful pieces of motorsport’s history, trapped in a garage or, worse, a museum, brought back on track, where they belong. That’s the only possible way to appreciate their majesty. He loves the cars, the racing and the nostalgia; I love the clothes, the music, the atmosphere (and yes the racing too!). It’s as if we have our own TARDIS which takes us back to the Golden Days of Motorsport every September. Vintage engines, fashion, romance & sunshine! What could be more perfect? Fantastic day out full of surprises with something for everyone. A memorable day which I will remember forever. These cars always remind me of the Goodwood Festival. I chose the iconic Warbirds. As far as I’m concerned the Revival is the greatest show on earth, everything you see is phenomenal and the memories will stay with you forever. However, the aircraft, in my opinion, always remind me of the sacrifice made by so many, and they always, without fail, bring tears to my eyes. It is a privilege to be part of an event which honours their memory in such a poignant, but spectacular and entertaining way. The clothes, the cars – the CAR! I love the pic of the couple dancing at the Blackout party, looks like good fun. This lady just sums up the very spirit of the Revival so well! I love this photo of the Freddie March Spirit of Aviation https://www.facebook.com/photo.php?fbid=440606945990503&set=a.439949129389618.122783.116589758392225&type=3&theater Getting up close and personal to these fantastic machines is a once in a lifetime experience. It makes me pine for the past! Love the warbirds album and the vintage bicycles! I want one! I liked the picture of the old pedal bikes. This one does it for me; the beautiful cars and the sunshine evoke the relaxed atmosphere. It has the beautiful buildings and settings of Goodwood, the glamour and of course the gorgeous cars!